Married in 1978 in Utah, William and Sandy Graves began their life together. Shortly after their marriage, William, who was active duty US Air Force, was stationed in England. It was during this three year stay, they welcomed their first daughter Amy. In 1981, William was transferred to Arizona, where he carried out the remainder of his time in the US Air Force, and retired after 20 years of service. In 1989, William and Sandy adopted their daughter Jennifer. 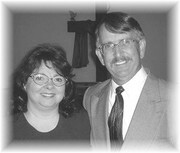 During their time here, William and Sandy became actively involved in their local church. William served as deacon, board member, usher, and associate pastor, while Sandy served as pianist, worship leader, teacher, women's ministry leader, and more. Their family has since increased in size and now includes two sons-in-law and two grandsons. In March of 1995, God spoke to their hearts and they launched New Life Worship Center in the living room of their Mesa, AZ home. They have both been devoted to full-time ministry for the last 20+ years, and are excited to see what else God has planned!